I like gadgets. I like to keep my gadgets with me, so that means I like bags, too. I go through phases – sometimes I want everything I can possibly carry with me, so I need a big bag. Sometimes I’m in a minimalist phase and want a small bag. I’m in a minimalist phase now, and I’m very frustrated with the small bags I own. It seems that most small bags have no organization in them. 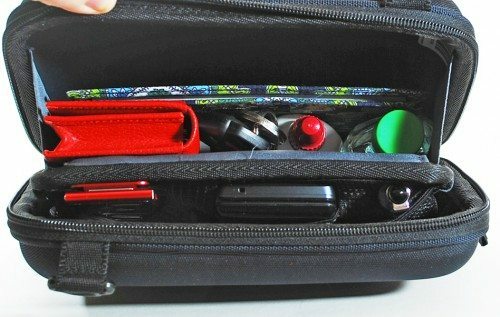 I want a bag that’s small so I can carry just the necessities, a bag that has a lot of organization so I can easily find my phone or my keys when I need them, and I want a bag that doesn’t cost so much that I can’t afford more gadgets. I happened upon a fabulous little bag that looked perfect for me recently. 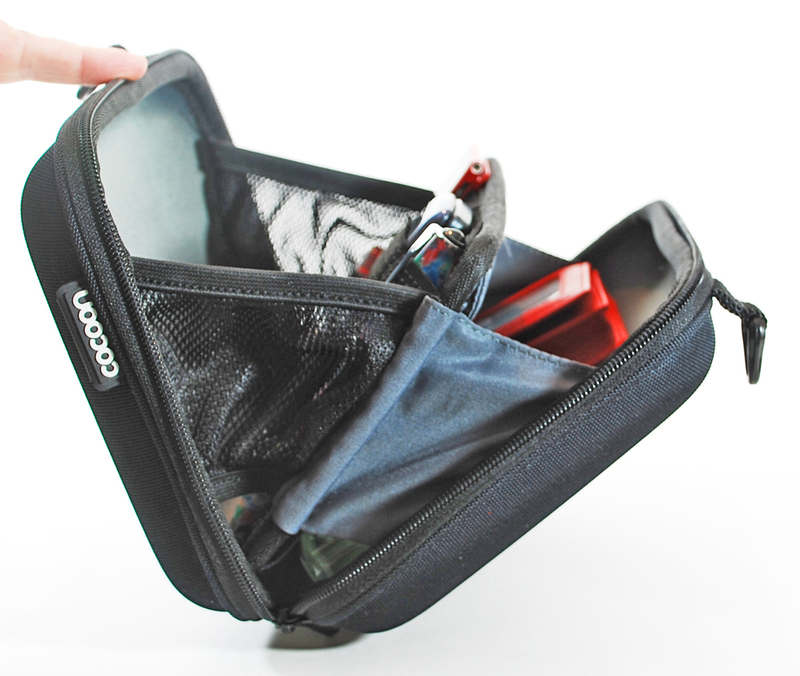 The CMB100 Mini Messenger Bag from Cocoon has a Grid-It organizer inside – it’s the very definition of “organized”. I placed my order and waited. Was it worth the wait? Click the photos in this review for an enlarged view. Also please note that the bag is actually a very dark black. Photos were lightened so that you could see detail in the bag. I like a wide range of styles, but I usually prefer a daily-carry bag – purse, handbag, whatever you want to call it – that doesn’t look like a traditional laptop bag or a piece of luggage. The Cocoon Mini Messenger bag doesn’t look like luggage or a laptop bag. It doesn’t even look like a traditional messenger bag. It’s not soft-sided, it doesn’t have a flap, and there are no exterior pockets. The Mini Messenger bag actually looks more like a small, cloth-covered box. 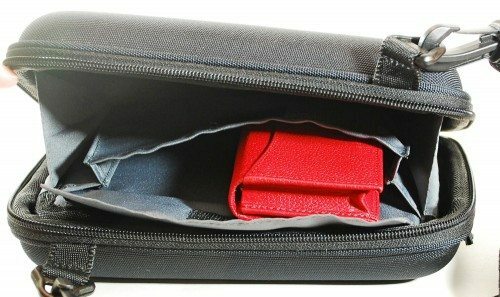 Inside is a hard, molded, shock-absorbing plastic case; the exterior is covered with a heavy-duty twill fabric. The interior is lined with what seems to be a dense, knit fabric. The Mini Messenger is available in black with a dark gray interior, midnight blue/dark gray, java brown/light gray, racing red/light gray, gun gray/lime, high-rise gray/light gray, and powder gray/red. I ordered the black with dark gray interior. The bag is 8.5” X 2.5” X 7” and weighs 1.13 pounds. Cocoon says the Mini Messenger is perfect for an iPhone, iPod, or Blackberry. I personally think it’s much too big to use just as a phone case, unless you always carry a lot of cables, chargers, and other accessories with it. The Mini Messenger doesn’t have a “grab” handle, but it does have a detachable, adjustable shoulder strap. The strap is made of a very soft, flexible belting material. It has a soft edge that never feels like it’s cutting my throat as I wear the bag. The strap is adjustable from 31” to 54.5”. All hardware for attaching or adjusting the strap is plastic, but it seems sturdy and strong. The strap also has a cushioned strap pad for comfort. The pad slides along the strap so you can move it where you need it when wearing the bag. Unfortunately, the pad is narrow, and it cannot slide over the adjustment buckle. That means the pad can’t be used when the strap is shortened because it won’t slide over the buckle to the center of the strap. The pad is comfortable enough, but I don’t like it because it never seems to be where I need it when I’m wearing the bag. I took pictures of the strap pad for this review, then I removed it from the strap. The pad won’t slide over the clips, so I had to cut it to remove it. Fortunately, the strap itself is very comfortable. There are no exterior pockets on the Mini Messenger. The only branding is a small, black, rubbery tag with “Cocoon” in raised white letters sewn into the zipper seams. 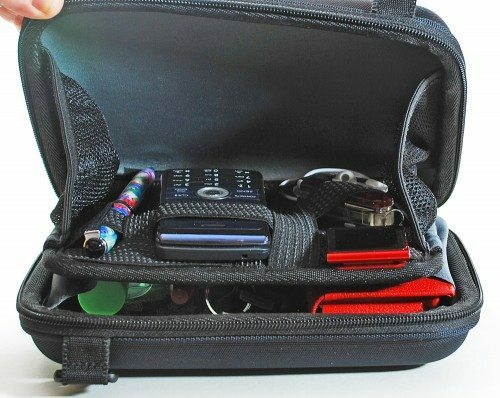 The Mini Messenger zips around three sides and about 1” (on each side) into the fourth side. The nylon zipper has double teardrop-shaped pulls. The bag has a fabric “hinge” on the fourth side, and it unzips to open like a clamshell. It is gusseted to prevent the bag from falling completely open and dropping the contents to the floor. One side of the gusset is stretchy black netting. The other side of the gusset is a non-stretchy fabric. There is a stiff divider board in the middle of the bag. One side of the board has a simple envelope-style pouch with a Velcro closure. The other side of the divider is a Grid-It organizer. The divider is permanently attached to the bag. This photo courtesy of the Cocoon website. 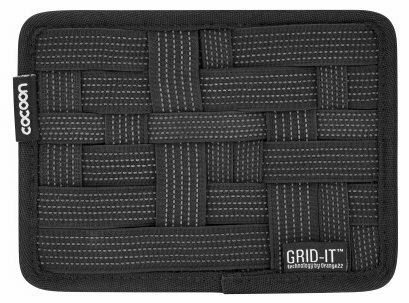 The Grid-It organizer is covered with interwoven elastic straps. The horizontal and vertical straps cross and intertwine randomly. The Grid-It board allows you to organize cables, phones, USB flash drives, pens, headphones – you name it. You simply slip the items under the straps, and the rubbery threads on the surface of the straps grip the item and hold it in place. The Grid-It side has the stretchy mesh gusset, so you can pull that side open far enough to see and access all the things you’ve stored in the elastic bands. 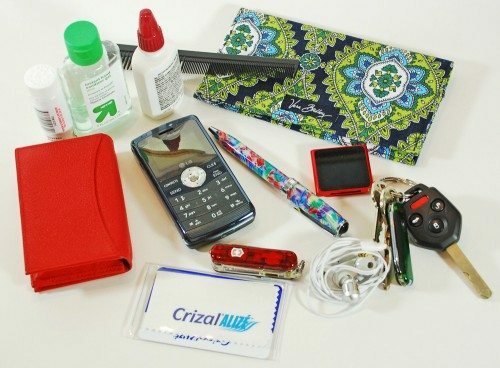 I have my LG enV3 phone, iPod nano, Swiss Army knife with USB flash drive, Arctic Cooling earbuds, and a pen stashed in the Grid-It. There’s a little more room on the board that could hold a couple more small items. The side of the divider board with the envelope-style pocket has the non-stretchy gusset. I find this side a little hard to access; I wish it would open just a bit more. I have a thick card case, checkbook, hand sanitizer and a couple OTC medications, a comb, and my keyring in that side. I keep my money – bills and coins – and a microfiber cleaning cloth in the envelope-style pocket. I don’t think I could fit anything else in that side of the bag. Complete contents of the Mini Messenger bag. 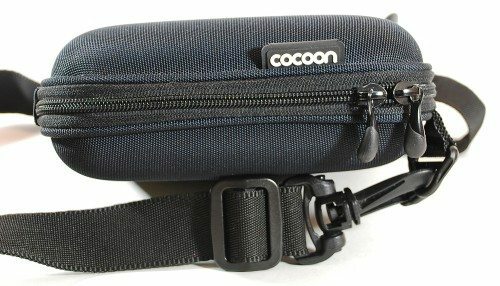 I really like the CMB100 Mini Messenger from Cocoon. It’s the perfect size when I’m in a minimalist phase. The Grid-It keeps my things organized. I can easily grab my phone and I don’t miss calls anymore. My iPod nano isn’t floating around in my bag getting scratched by my keys or pen. And the panic button on my car fob isn’t getting accidentally triggered while I’m digging around in my purse. This bag may not be feminine enough for some ladies, but I think it’s a great unisex style that would work as a daily bag for men or women. I may get a couple more colors while the bag is discounted at Cocoon. 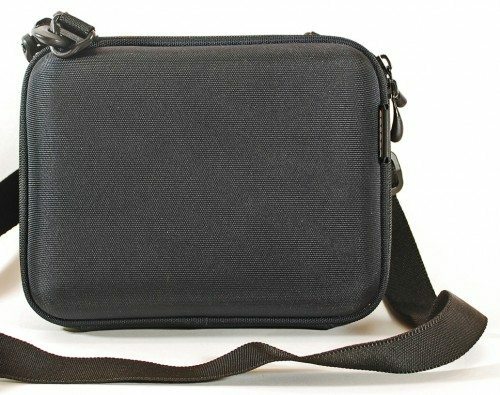 Cocoon CMB100 Mini Messenger Bag Review originally appeared on The Gadgeteer on January 19, 2011 at 9:30 am.